The Victoria Government has released the designs for Victoria’s first-ever ‘vertical school’ at Ferrars Street, South Melbourne. 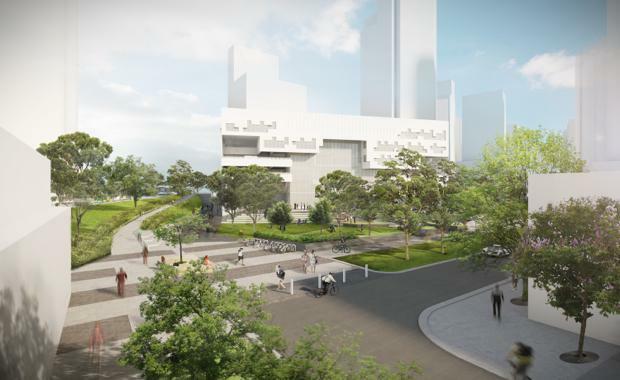 The Government has been working closely with the City of Port Phillip and the Ferrars Street Planning Committee to deliver a shared vision for the Ferrars Street education and community precinct. Education Minister James Merlino and Planning Minister Richard Wynne today released the first images of the school and surrounding area which will accommodate over 525 students. The new images include proposed treatments for the surrounding streetscapes, including tree planting, partial closure of some roads, drop off points for the school and upgrades to intersections, including opening up the Ferrars Street/City Road intersection. Adjacent land has been purchased for $19 million to be developed as a park while another $5 million has been allocated for local infrastructure, including improvements for two nearby tram stops on the 109 and 96 routes. The contract for remediation of the school site will be awarded shortly with remediation works completed by May. Significant planning work has been done to ensure the new school delivers the services required by the existing community and the Fishermans Bend precinct. The proposed school forms part of the broader Fishermans Bend Urban Renewal Area (FBURA), which is expected to accommodate around 40,000 jobs over the next 30 years. A new ‘Planning hub’ has been established to coordinate work by the different government agencies and the Cities of Melbourne and Port Phillip. Work is also underway on detailed neighbourhood strategy plans for each of the five Fishermans Bend precincts. A consultation session will be held on February 29 at the North Port Oval, Port Melbourne, at 6.30pm. The new Fishermans Bend Planning Hub and Council will soon be discussing the details of the Ferrars St precinct plan with the community.